Hi friends here is the another Mobile repairing tutorial about how you can recover or unbrick dead boot Coolpad 8297l i00 or 8297l 100? As you sometimes after flashing the phone it will not boot up due to mismatch of firmware ROM and at that time you may looking for the solution to recover the Coolpad Dazen 1 and there are several procedure to recover the dead Qualcomm Coolpad phone and here we will discuss about one of the best solution to recover the phone. Qualcomm Coolpad dead boot repair and EDL mode firmware download link also available here. The Qualcomm Flash Image Loader (QFIL) is free software flash tool which can be used to flash Qualcomm firmware to the phone. When the Coolpad phone is dead it shows only the Qualcomm HS-USB QDLoader 9008 COM port for the model 8297l-100. Please see the below steps to recover your dead Coolpad phone. Download and extract the Coolpad QFIL ROM. Open QFIL and select built type Flat Built. Now hold both volume keys and connect USB cable to the Computer. 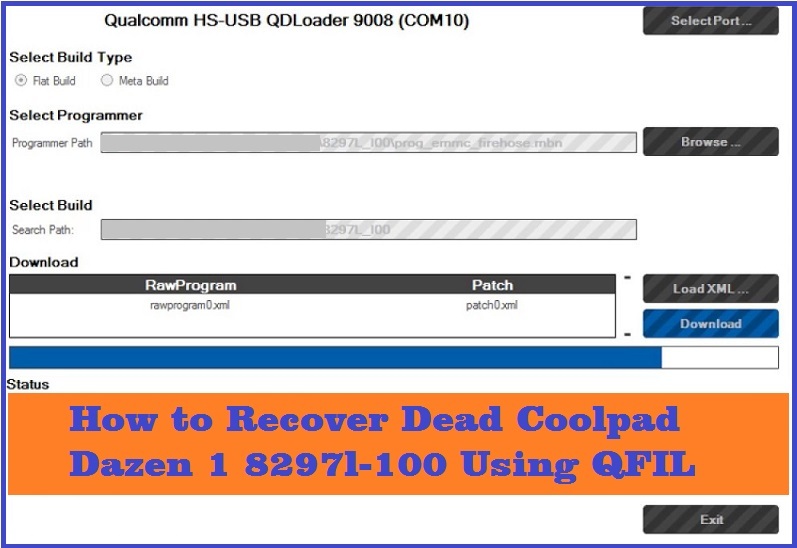 If your Coolpad Dazen 1 8297l-100 dead and showing only Qualcomm HS-USB QDLoader 9008 COM port when you connect the phone to the Computer, then you can recover the phone using this method, so please follow the above process to unbrick dead boot Coolpad Dazen 1 smartphone. So in this way you can flash the dead Coolpad Dazen 1 8297l-100 using QFIL Flash Tool and QFIL firmware of this model. As I said before there are several process to unbrick or recover the dead Coolpad phone and here is the procedure by using the QFIL flash with QFIL Coolpad Qualcomm firmware. You can search this site for all possible solution for recovering the dead Coolpad smartphone.